Cupcakes 'n Daisies: It's March ! ! ! It's March ! ! ! I figured a new month meant I better swap out the quilt I had hanging on my living room wall. Myths of Avalon had been up since the first of January. Even though this wall doesn't get direct sunlight, I plan to change quilts every couple of months. I would go with a new quilt every month, but I just don't like climbing that ladder. So I looked over my available quilts and decided on this poor quilt that rarely sees the light of day. It's too small for a bed and too big to hang over the red couch, I think I may have hung it over the bannister once, but it usually just hangs in a closet. I think the prints are good for this time of year, they add some color to the room but don't shout spring, the colors kind of whisper spring, which matches the March weather we usually see in Illinois. At first I thought it may be too big for the wall space that I have, but since it's not an overly busy quilt, I think it looks fine up there. I don't think I could go with a quilt that's any bigger, that's for sure. If you would like more information about this quilt, this is Lifetime Quilt #16. Thanks so much for all your good wishes for my marathon weekend. First, I'm happy to report I only lost 2 "jewels" from my shoes during the race! Most everyone was dressed up for the race, plenty of tiaras and tutus, but I didn't notice any other bedazzled shoes! When we picked up our racing bibs, my daughter and I actually squealed like 6 year old girls when we saw our names, "Princes Thelma" and "Princess Ashley"! 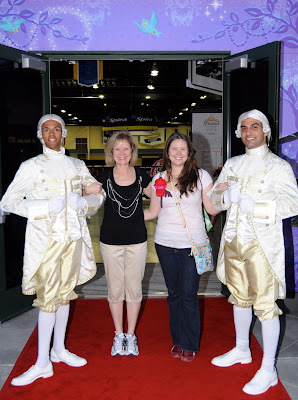 here we are, being greeted by our footmen before we pick up our race packets. 13,091 ladies finished the race, the fastest runner ran 13.1 miles in 82 minutes, I was a little slower, I was 5,295 runners behind the winner. Think you're too old to participate, the oldest finisher was 82! Here we are, in front of Cinderella's Castle, proudly wearing our finishers medal. Ashley and I ran the entire race together and crossed the finish line at the same time. It was a wonderful weekend, the weather could not have been any better. For some reason, crossing the finish line with my daughter, was a very emotional moment. I was just so thankful to be healthy enough to finish the race, to share the experience with my daughter, and so relieved that my training paid off. I cried like a baby when I received my medal. I'm still behind on my email after being out of town, if you're waiting for a response from me, I hope to get caught up this weekend! Oh I feel like crying too!! I know how much those moments you share with your child means. Sometimes it just rushes in and hits you, and you realize how blessed you are. Congrats on the great finish!! Disney doesn't do anything half way! The footmen are very unexpected though. Congratulations on your finish! Achieving such a wonderful accomplishment is very satisfying and I can easily see how it would be emotional for many reasons. First off, I love the quilt and where it is hanging!! Just perfect!! Second, boy did I miss that post on the 1/2 marathon. Very inspiring!! I just started to pick up running again. It is difficult to get started, and to do it consistently, but I am determined to do it. So you have totally inspired me with your finish. Just wonderful!! Congrats!! Woohoo! Congratulations on your finish! And I think your quilt looks perfect on the wall. Its a beautiful quilt. I can totally understand the emotions! What a great experience to share with your daughter. Congrats to both of you for your accomplishment! And I totally loved the picture of you running. The quilt looks beautiful hanging in that spot and what a beautiful home you have. Congrats on finishing the race. Good health celebrated. Health to run is a gift and a blessing. What fun to do that with your daughter. I really like your quilt and it looks good in the stairwell. Now if you don't mind, I have a house decorating question. Your house is similar in design to mind and I'm wondering what you have in your room at the top of the stairs. I'm hoping it's a dining room as I'm trying to get my husband to convert our similar room to a dining room. Congrats on the run by the way. Way to go. So proud of you. Great mother daughter time too. Good job on the run! I love the quilt! By the way, the quilt looks terrific there. You have reminded me that I need to switch my quilts out too... I'm late because I don't like having to pull out the ladder either. I hope to one day have enough quilts to switch them out. I have to stop giving them all away for that to happen though. Congratulations on finishing the race! Thelma...You look like you were having such a wonderful time. Way to GO, and Congratulations to both you and your daughter. You make a great team! Thank you for sharing your special week end with us. I have so many wonderful memories of time spent with my daughter, Kris so I know exactly how you feel. Sounds like a wonderful time. Congrats on your finish! Congratulations to both of you for participating in and completing this race! Wish I could have been there---on the side lines cheering you on! You should be so proud. Thelma, YOU ROCK! Enjoy your medal..it's so pretty!!! Wear it everyday LOL! and love the medals...looks like a great day.and love the quilt on the wall too...very nice..as all of your quilts are..rofl..
Congratulations! Be proud of that medal! What wonderful pictures " Princess Thelma " :-) You should be so pruod to have run the whole race and how special running with your daughter. What a great accomplishment ! Oh, awesome. 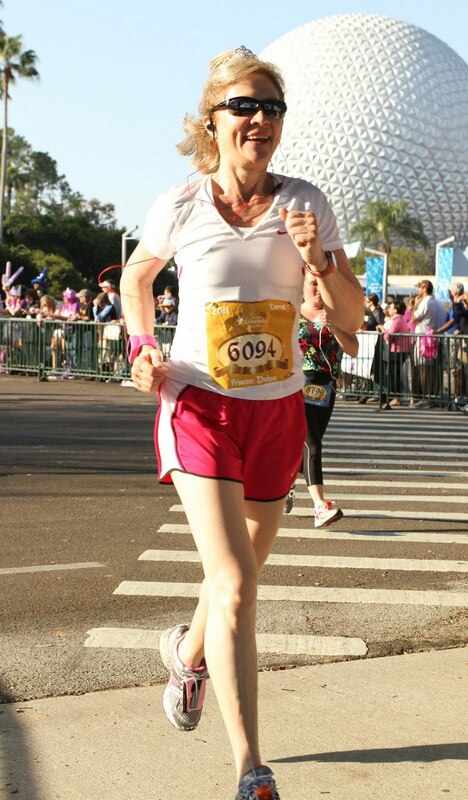 I was at WDW the weekend of the marathon. It was great weather for your run. Congrats Thelma on your 1/2 Marathon! 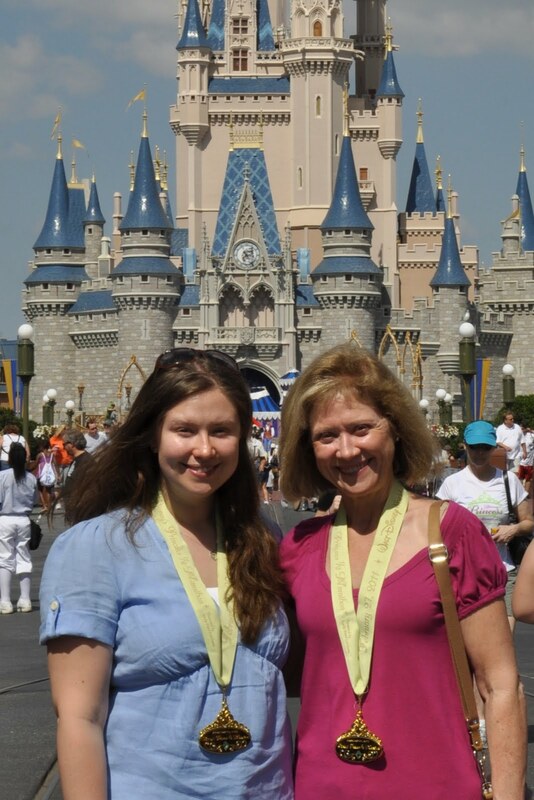 What wonderful mother-daughter memories you're making. I like that quilt too. It does whisper spring. I do love that quilt display spot. It's perfect! Love the quilt too, I remember reading about how you changed the pattern and liking what you did. Congrats on the run! You and your daughter are both so pretty! Thelma! Congratulations! That is just amazing and wonderful that you ran the 1/2 Marathon AND sharing that event with your daughter was fantastic. (now I have a little tinge that maybe I should do the same with my son who is a runner). Although you can't beat those tiara's and the royal treatment from Disney! Congratulations again!!!! Congratulations on a race well-run. I echo the sentiments of all the other posters in comments about running the race with your daughter. And thanks for revealing to us how you get those quilts up there (a ladder). I had wondered if you slung them across from the balcony, but thanks for revealing the secret. What a wonderful event that you got to share with your daughter...time to treasure forever.Disney sure knows how to do it right. Love the new quilt hanging. You are so brave to do the ladder and the stairs. YIKES! From that huge smile on your face, it looks like you could have finished a whole marathon! Are you *sure* a gallon of gas was only 24 cents when you were born??? You don't look a day over 36 cents! What a fun weekend and what an accomplishment! I went to a Quilt Show ! It's Tuesday . . .
My Ode to the Show . . . .
Short and Sweet . . . .
Name This Dog . . . . It's Tuesday . . . .
A Few Updates . . . . .
Another MGF? . . . .
Its Tuesday . . . .
Olde World Stars and The Winners Are . . . Celebrate Good Times - Come On . . . .